The fabulous flavors of a BLT come together in this BLT Pasta Salad with spinach, crispy bacon, and grape tomatoes tossed in a simple dressing. It’s the perfect summer pasta salad! During the summer months, I find myself making a different pasta salad nearly every week. They are easy to make, and there are so many ways to change them up. Not only that, but pasta salads are light and perfect for a simple supper or a side dish at BBQs and potlucks. 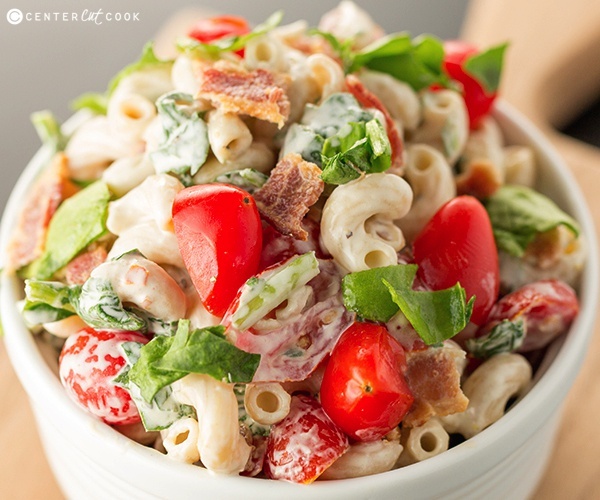 When I was trying to brainstorm the next pasta salad that I should make, I decided to combine all of the fabulous flavors of a BLT sandwich (another summer fave) and try making a BLT pasta salad. The result? An awesome summer pasta salad with great flavor that you will want to make over and over again! 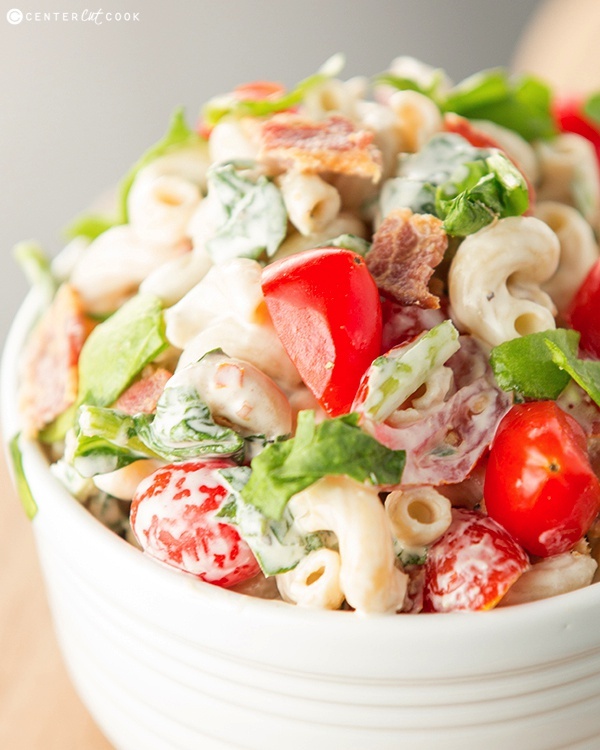 The ingredients in this BLT Pasta Salad are super simple. You will start with elbow macaroni, or any pasta of your choice. Then you’ll need grape tomatoes but you could also use cherry tomatoes and just cut them into quarters. I used about 8 slices of thick cut bacon that I cooked until crisp, then crumbled. In place of traditional lettuce that you’d have on a BLT sandwich, I used baby spinach that I chopped up. I tried making this pasta salad with whole baby spinach leaves, but discovered it was better to chop up the spinach into small pieces. 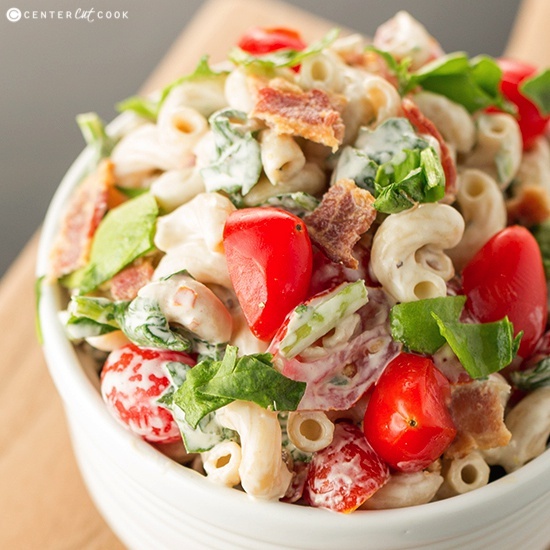 The dressing for this BLT pasta salad includes the traditional pasta salad dressing suspects – mayo, a little vinegar (use apple cider if you have it), just a smidge of sugar, salt and black pepper. You will want to allow the pasta salad to chill in the fridge for about an hour before serving. Light, fresh, and full of flavor, this BLT Pasta Salad will quickly become one of your go-to summer pasta salads. In case you’re looking for a couple of other pasta salads to try, go checkout my Creamy Cheddar Pasta Salad, Easy Ranch Pasta Salad, my BBQ Macaroni Salad or Easy Macaroni Salad.Enjoy! Cook elbow macaroni according to package directions, then drain and rinse the pasta under cold water until the pasta has cooled. Drain well. In a large bowl, combine mayo, sugar, apple cider vinegar, salt and black pepper. Combine the pasta with chopped tomatoes, bacon, and spinach. Stir in the dressing until well combined.